Art has long been a powerful means of release and resistance for those suffering under oppression. It is often the case that the more miserable the situation, the more potent the art, and the more passionate the artist. This is certainly true with the arts of caricature and political cartooning, which have primarily served as tools of public criticism. Therefore, cartoons have often been subject to more extensive censorship by reigning powers than other types of art. Cartoonists throughout time have frequently risked life and limb in publishing their work yet continue to spread their messages in paint and ink. Nowhere else is this as relevant as in the Middle East, which has suffered under the censorship of repressive regimes for most of its modern history. 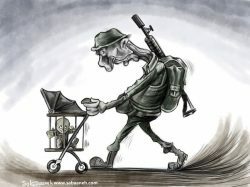 Therefore, it comes as no surprise that one of the most tragic and enduring conflicts in this region, the Israeli occupation of Palestine, has produced a plethora of influential cartoons and cartoonists whose impact can be felt world-wide. 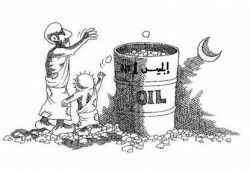 When seriously discussing Palestinian political cartooning, one must mention the name Naji al-Ali. Failure to do so would be like robbing a tree of its roots. Naji Salim Hussain al-Ali was probably the most famous cartoonist in the Arab World, and certainly one of the most outspoken. 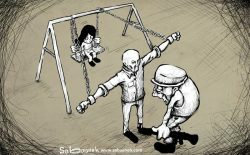 His cartoons were brutally honest in criticizing not only the Israeli occupation, but also injustice elsewhere in the world. He even satirized the corruption he saw in the leadership of his own people. All in all, he produced more than 40,000 individual cartoons. However, his outspoken defiance came with a heavy price: he was frequently jailed, censored, and given more than 100 death threats throughout his career. On July 22, 1987, al-Ali was assassinated in London by an unknown assailant. Many suspect him to have been killed on the orders of the Palestinian Liberation Organization (PLO). This was because he drew a cartoon which criticized the PLO leader, Yasser Arafat, concerning an extramarital affair he had with a woman named Rashida Mahran. On the other hand, the Mossad, the Israeli intelligence agency, may have been the perpetrators. This is because it was later revealed that they had foreknowledge of the assassination, but failed, or refused, to pass it on to British authorities. However, there is no direct evidence that either of these parties, or any other group for that matter, is responsible for Naji al-Ali’s death. Thus the case remains open to this day (Guyer 2017). One of al-Ali’s greatest achievements was the creation of his signature character: the perpetually-young Handala. Handala was depicted as a little, barefoot boy with shabby refugee clothing and sparse, spikey hair. He always faces away from the viewer, rarely revealing his face, his hands thoughtfully crossed behind his back. This figure was inspired by al-Ali’s own experience as a child refugee after his village was destroyed in the Nakba (lit. “catastrophe”) in 1948. At this time, around 750,000 native Palestinians, including 10 year-old Naji al-Ali, were forcibly expelled from their homes to live destitute as refugees in neighboring Arab countries. The name “handala” (حنظلة) is derived from hanthal (حنظل) which is the Arabic word for colocynth, a type of bitter gourd found in the desert. With this, Handala represents the bitterness of the Palestinian experience and the hope of returning to the homeland. A cluster of ripe colocynths. Naji al-Ali drew cartoons on a plethora of issues. 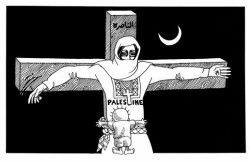 The selection below features a few of his cartoons touching on subjects such as the corruption of Yasser Arafat, the persecution of Palestinian Christians, and threats against free speech. As you can see, Handala is featured in every one of them either solemnly observing the scene, or actively participating in it. In fact, Naji al-Ali liked the character so much that he eventually started to use him as a sort of personal signature. The impact of Handala as the symbol of the Palestinians’ right to return to the lands they lost after 1948 should not be underestimated. The character has evolved out of solely representing the Palestinian cause to supporting other causes around the world with similar ideals. 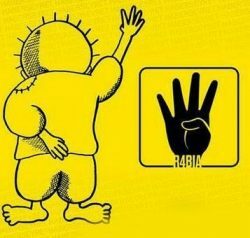 An example is the cartoon below, where Handala is holding up four fingers in solidarity with the victims of the Rabi’a Square Massacre in Cairo, Egypt (“Rabi’a” means “four”, or “fourth”, in Arabic, hence the four fingers), in which a group of Egyptians were protesting the military coup against the Egyptian President, Mohamed Morsi. The tradition of political cartooning in Palestine thankfully didn’t end with the death of Naji al-Ali. In fact, it spurred it on! 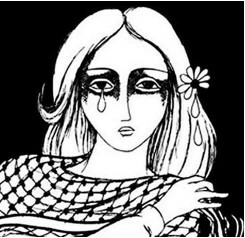 Many Palestinian cartoonists today trace their inspiration back to al-Ali’s extensive work. 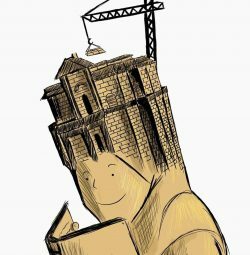 Probably among the most prominent of contemporary Palestinian cartoonists drawing in the same vein as Naji al-Ali is Mohammad Saba’aneh, a Kuwaiti-born Palestinian. In fact, Saba’aneh has applied his art not only to criticizing the injustices of daily life in the Occupied Territories, but also to supporting himself and his community. 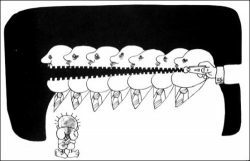 He started out simply drawing daily cartoons which portrayed life in the occupied territories which he published in various newspapers, such as Al-Arabi, Al-Quds, and Al-Etihad. He also drew portraits for the Palestinian martyrs, i.e. those who have died during the course of the conflict, to be displayed at their funerals. 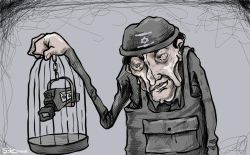 As time went on, Saba’aneh’s cartoons started to ignite the ire of the Israeli authorities, and in 2013, he was arrested under false charges of collaborating with Hamas. He was held in an Israeli jail for 5 months in prison, 2 weeks of which he spent in solitary confinement. Luckily, he managed to obtain some paper and a pencil under the nose of an interrogator. These materials turned out to be a great boon for him because he used them to draw cartoons depicting daily life in the prison. This kept him from falling into despair, especially during his two-week stint in solitary confinement, “This paper was all that I had inside the prison. It was (a) big victory for me over the Israeli government. That’s what I thought, just because I wanted to support myself inside the jail.” These drawings would later form an exhibit which has been displayed in many venues around the world. 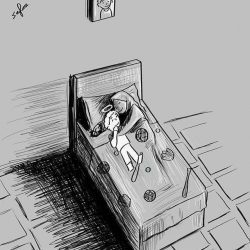 Saba’aneh’s work contains a number of deliberate stylistic choices which distinguish his work from that of other cartoonists, particularly concerning the cartoons which deal directly with the plight of the Palestinian people. 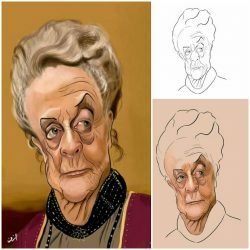 The most striking feature of his cartooning style is that he often draws his Palestinian characters with blank eyes and haggard faces. They reflect the harsh, soul-draining circumstances of the occupation. Mohammad draws them grotesquely because the occupation is itself grotesque. 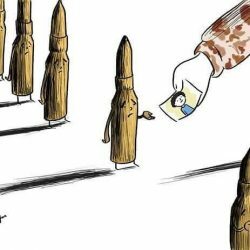 If you look closely at this series of cartoons, you will see certain recurring characters which represent a number of groups and circumstances involved in the conflict. One of the most prominent figures in his earlier cartoons is a plain main. 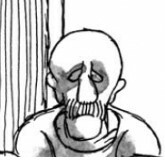 He is often depicted as a tall, gaunt, bald man with a stern face clothed in what appears to be either a frown or the absence of a mouth all together. His eyes are often closed in stoic exertion and resistance to the forces that beat him down, though sometimes they are shown as blank and hollow like the rest of his people. He could possibly represent the average Palestinian living under the occupation. Another character is a woman in traditional Palestinian clothing. She sometimes accompanies the man, and at other times stands alone. She is often situated in such a way as to represent the particular pain and struggle of being a woman in Palestine, especially one whose young children have been killed or arrested. Unfortunately, this is still an all too common occurrence in the Occupied Territories. In addition, she sometimes represents the land of Palestine itself, the “Motherland”. Often accompanying the two is either a bald younger child or an older child. The younger child is a small, bald boy dressed in plain clothes. The older child is likewise a small boy, though clearly drawn taller than his younger counterpart, sporting a full head of black hair. His face is often gaunt and miserable-looking. There remains but one set of figures left: the soldiers. 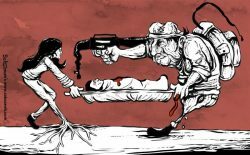 The soldiers depicted in Saba’aneh’s cartoons very clearly evoke the human rights abuses of the Israeli government on the Palestinian people, which are more often than not carried out by actual Israeli soldiers. Like the other figures in Saba’aneh’s cartoons, they are drawn ‘ugly’. One of the soldiers is flabby and stern-faced, with callous, beady eyes and misshapen, troll-like features. The other is skinny, gangly and has an over-sized head. 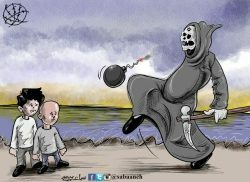 This is further evidence of Naji al-Ali’s impact on the cartoons of the Arab World. 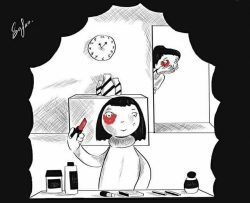 Last but not least, Safaa Odah is another very determined cartoonist living in a very severe situation. As a native of Gaza, Odah resides in one of the more conservative neighborhoods in the area. She, like most other Gazans, suffers daily from the Israeli military blockade which has been in place since 2007, a year after Hamas won the Palestinian Parliamentary Elections and created a government in the Gaza strip. This blockade has had devastating effects on Gaza’s economy and infrastructure, such as its high unemployment rate (44 percent as of 2017), and severe over-crowdedness. It is in this set or circumstances that Safaa Odah first began to draw. It started one day in 2009 after Odah had been notified that she didn’t get a job that she applied for. As we have seen, having a paying job is extremely important in Gaza, so one could imagine the frustration that she felt. This was especially heartbreaking for her because it was a job for which she was fully qualified, but was most likely denied her simply because her family didn’t have the right social connections to secure it. In exasperation at her failure, and at all the other grievances of daily life in Gaza, she began to draw furiously. That first drawing was of a girl chasing after a bird, trying to capture it in vain, whereas another girl manages to do it because she has the right help. This little cartoon would be the first of many by Safaa Odah. For lack of any other format to publish them, Odah posts her drawings on various social media, including Facebook and Instagram, and doesn’t receive any payment for them. 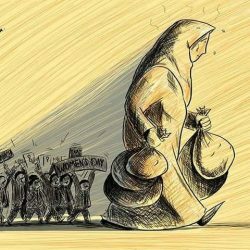 Regardless, her drawings portray, and criticize, the harsh realities of life in Gaza. However, she does this in a wonderfully deceptive fashion: Odah draws in a style reminiscent of cartoons in children’s books. 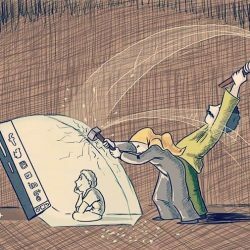 Here, we have two cartoons which look innocent at first glance but are pregnant with meaning. In one, a mother happily snuggles close to her son, and all seems fine until we realize that the poor child is, in fact, dead. In the other one, otherwise friendly-looking bullets reluctantly take the photos of those they are destined to kill. 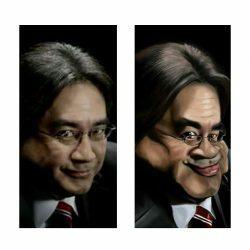 She has also drawn a number of hyper-realistic caricatures. All of these courageous artists are shining examples of how suffering can produce not only great art, but also remarkable endurance. Not one of these people has voluntarily ceased drawing cartoons despite all the pressures that have been thrown on them. Naji al-Ali even gave his life for his art. In the end, it was never really about the art in and of itself. 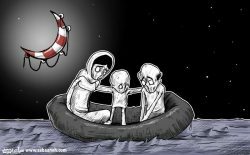 In continuing to draw their cartoons, Naji al-Ali, Mohammad Saba’aneh, and Safaa Odah are resisting the cruelties of the occupation and fighting to secure justice for the Palestinian people. Abdelrahman, Sanabel. 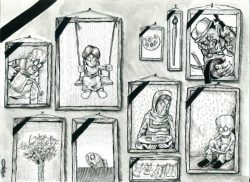 “The Desolate Spaces in Naji al-Ali’s Cartoons,” Muftah.org, 17 Mar. 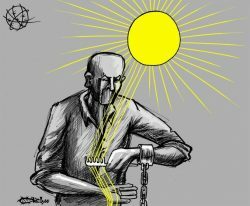 2018, muftah.org/the-desolate-spaces-in-naji-al-alis-cartoons/#.W2hy1UxFzct. Accessed 9 Jul. 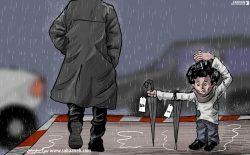 2018.
www.thenational.ae/world/mena/safaa-odah-gaza-s-besieged-cartoonist-turns-pain-into-art-1.733957. Accessed 25 Jun. 2018. 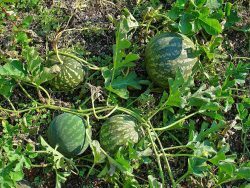 “Citrullus colocynthis (L.) Schrader,” Asergeev.com, 13 Aug. 2008, http://www.floraofqatar.com/citrullus_colocynthis.htm. Accessed 9 Jul. 2018. “Doodling Dissent: Political Cartoons in the Arab World,” Center for Strategic and International Studies, 20 Feb 2015, www.csis.org/analysis/doodling-dissent-political-cartoons-arab-world. Accessed 9 Jul. 2018. Guyer, Jonathan. “Revisiting the great Palestinian cartoonist Naji al-Ali 30 years after his assassination.” Public Radio International, OZY Media News, 31 Aug. 2017, www.pri.org/stories/2017-08-31/revisiting-great-palestinian-cartoonist-naji-al-ali-30-years-after-his. Accessed 25 Jun. 2018. Handala.org, n.p., n.d., www.handala.org. Accessed 25 Jun. 2018.
https://stepfeed.com/naji-al-ali-remembering-the-palestinian-cartoonist-30-years-later-9627. Accessed 9 Jul. 2018. “Mohammad Sabaaneh,” United Sketches, WordPress, n.d., www.unitedsketches.org. Accessed 9 Jul. 2018. “Mohammad Sabaaneh and Seth Tobocman at Parson’s, April 2017,” YouTube, uploaded by justworldbooks, 27 Apr. 2017, https://www.youtube.com/watch?time_continue=808&v=oVPTJxuej-s.
Naji al-Ali: An Artist with Vision, Directed by Kasim Abid, Icarus Films, 2000. “Palestine’s Economic Outlook – October 2017,” The World Bank, 11 Oct. 2017, www.worldbank.org/en/country/westbankandgaza/publication/palestine-s-economic-outlook–october-2017. Accessed 31 Jul. 2018. “Quick Facts: The Palestinian Nakba,” Institute for Middle East Understanding, 13 May 2015, imeu.org/article/quick-facts-the-palestinian-nakba. Accessed 9 Jul. 2018. Salam Kawther, ed. “Corruption and the Mistresses of President Arafat.” Europa and Middle East News, n.d., www.kawther.info/wpr/2013/01/28/corruption-and-the-mistresses-of-president-arafat. Accessed 9 Jul. 2018. Sanchez, Raf. 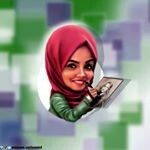 “Safaa Odah: The perils of being a viral Palestinian cartoonist in Gaza,” The Telegraph, Telegraph Media Group Limited, 21 May 2018, www.telegraph.co.uk/news/2018/05/21/safaa-odah-perils-viral-palestinian-cartoonist-gaza/. Accessed 9 Jul. 2018. Strickland, Patrick. “Jailed by Israel for his Cartoons, Mohamed Saba’aneh speaks out,” Electronic Intifada, 13 Nov 2013, electronicintifada.net/content/jailed-israel-his-cartoons-mohammad-sabaaneh-speaks-out/12924. Accessed 9 Jul. 2018. Weiss, Philip. “Mohammad Saba’aneh has no choice but to become a political artist,” Mondoweiss.net, Center for Economic Research and Social Change, 27 Apr. 2017, mondoweiss.net/2017/04/mohammad-sabaaneh-political/. Accessed 9 Jul. 2018. Ziad, Mohammad. “The Gift of Handala: Palestine’s Boy,” PaliRoots, 8 Sep. 2017, www.paliroots.com/blogs/news/the-gift-of-handala-palestines-boy. Accessed 9 Jul. 2018.